It's time for part two of our space discussion. This time, we are going to talk about big spaces. Who doesn't like big spaces? They provide intense mental stimulation, lack of restriction, and they make it incredibly convenient to entertain large crowds without feeling crammed or claustrophobic. However, there are several drawbacks. Often times they can be difficult to handle because they don't feel homey or comfortable, and they can lack personality and intimacy. No one wants their home defined as cold or impersonal, so here are 6 ways to make your big spaces feel cozier! When it comes to making big rooms feel more human, patterns are where it's at! 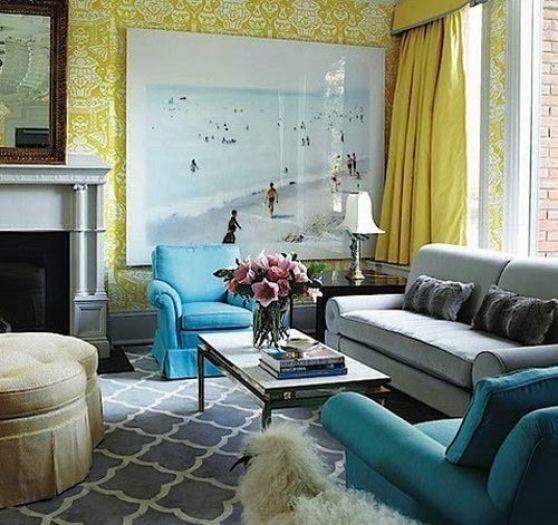 Medium to large scale patterns are best because they visually advance a room and invigorate the mind! Interesting and bold patterns can help distract the viewer from noticing an overload of space. Whether it's wallpaper, upholstery, or curtains you're looking at- go big! Nothing can warm up a space like a gallon or two of paint! 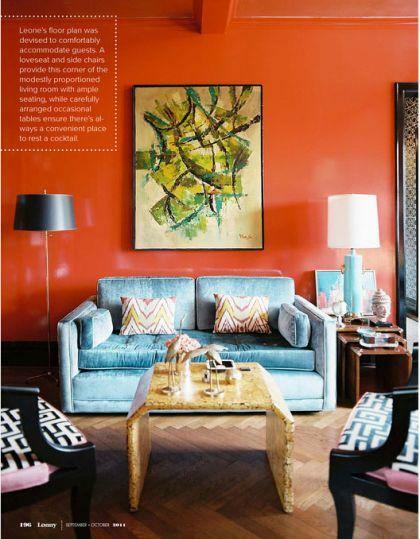 While light colors are terrific for small spaces, dark or vivid colors work best in large spaces since they absorb light, making the room feel smaller and intimate. If you have high ceilings, painting them a dark color will visually drop them down too. Small scale furniture works optimally in small spaces, but in large spaces it just looks sad, forgotten, and out of place. 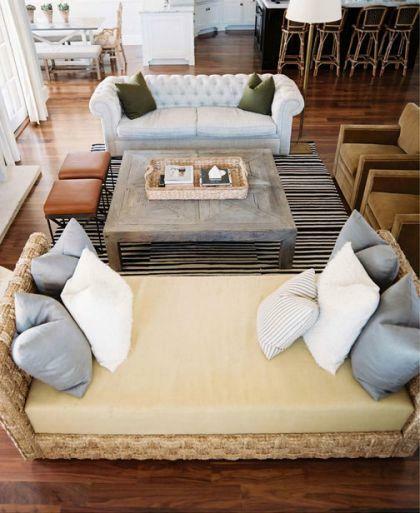 Incorporating heavy, solid furniture into a big space helps the room appear grounded, finished, and filled. If you're contemplating buying a certain piece of furniture for a room, remember to ask yourself if it will help define the large space, or simply get lost in it. 4. Top of Your List? Area Rugs. 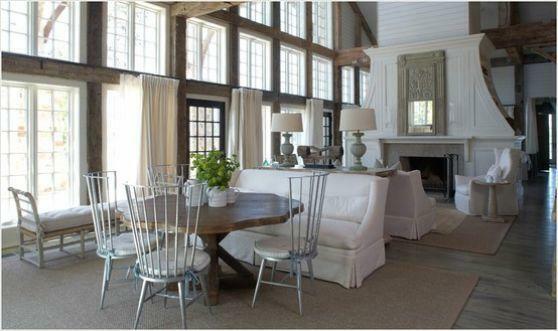 One of the easiest ways to cozy up a large space is to throw down some area rugs! Not only are they pretty and interesting to look at, but they help to anchor furniture, and break up the floor, making the space appear smaller than it really is. Have you ever seen a piece of artwork that is way too small for the wall it's hanging on? Read: overlooked, lonely, institutional. Large scale artwork can be a great asset to an overwhelmingly spacious room because it breaks up the sea of wall, and provides visual entertainment for the viewer. 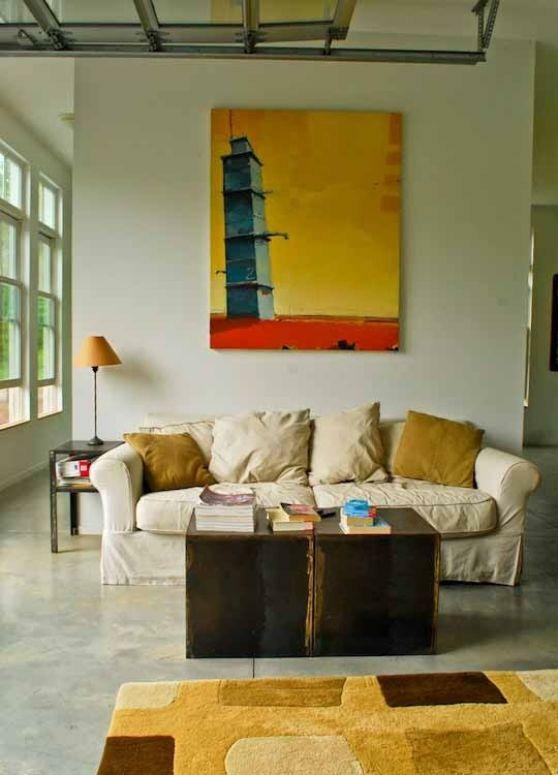 Again, be sure to consider scale when deciding on art pieces for a big room. Another way to effectively manipulate a big space is to place furniture away from the walls, and create multiple furniture groupings. This is a great way to eat up some of the excess space, while creating several different conversation areas to make the space feel more homey and down to earth. Have fun experimenting with your big spaces!! P.S. Remember to enter the Sony Tablet giveaway if you haven't already! A winner will be randomly chosen and announced next Wednesday, Nov. 2nd! Opinions Wanted: Pick Your Favorite Sofa! Have you been into one of our store locations lately? Recently, all of our full line stores got new "Get Connected" kiosks- filled with the latest tablets, computers, phones & ipods on the market! The great part is that there are friendly electronics specialists available around the clock to simply answer all of your questions! So hurry on over and check it out! To help one of you get 'better connected' I am going to give away this Sony 16GB Tablet (retails at $499.99!) 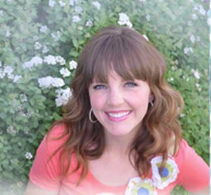 Simply become a follower of the blog if you aren't already, and leave a comment telling me why it's time for you to get connected! One entry per person allowed. A winner will be chosen two weeks from today, Wednesday November2nd at 3:00pm Mountain Time. I have one goal for myself this weekend, and one goal only. I don't care if my house doesn't get cleaned, laundry doesn't get done, projects don't get finished (or worked on for that matter), or if we have to live off ramen noodles because I don't go to the grocery store. But mark my words, I WILL take a trip to the pumpkin patch!! It's mid-October, and my home is still pumpkin-less. Shameful, right? The important thing is that I have a plan. After picking out my new pumpkins, I'm going to give them the royal Martha Stewart Treatment.....read: beautify, be-dazzle, glamify. 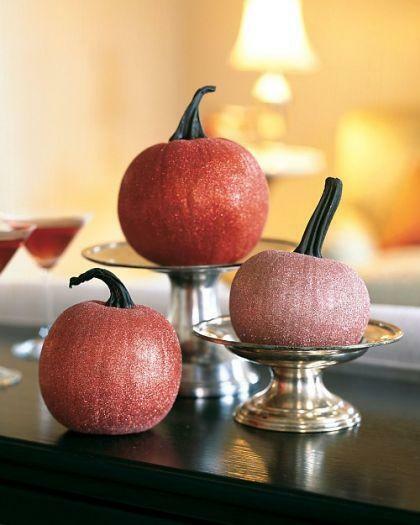 Say hello to a little glue and colored glitter, and VOILA.... you've got yourself some lovely, classy showcase pumpkins! 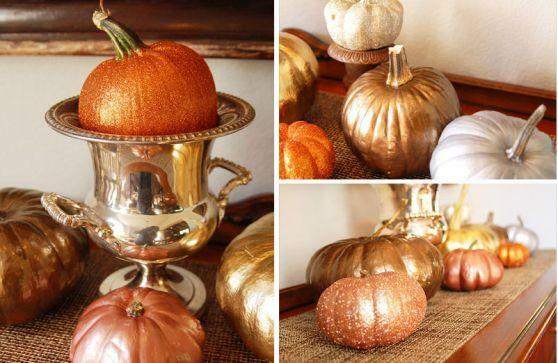 I also really like the idea of putting a can of gold spray paint to use in addition to the glitter! Such a fast, simple way to spice up a plain pumpkin. Thank you Martha, from the bottom of my Autumn loving heart. Check out her glitter-pumpkin tutorial. Turn on the news and you can't miss it. With the passing of Steve Jobs yesterday, the world is paying tribute to this visionary entrepreneur who literally changed the world. When you have a few minutes, watch Steve Job's 2005 Stanford Commencement Address. Whether you're an apple fan or not (okay, who really isn't though? ), there are a handful of valuable and inspiring takeaways that anyone can appreciate. I think I've mentioned before that I have an aversion to pie. We just don't agree with each other. (I'm positive that it has something to do with warmed fruit---- I've got major texture problems!) There is however, one kind of pie that I truly salivate over. It helps that I believe the peach is the most perfect fruit in existence, and that it's served cold (no baking of the peaches involved). Well, peach season is almost over my friends, so you've got to get to work fast! 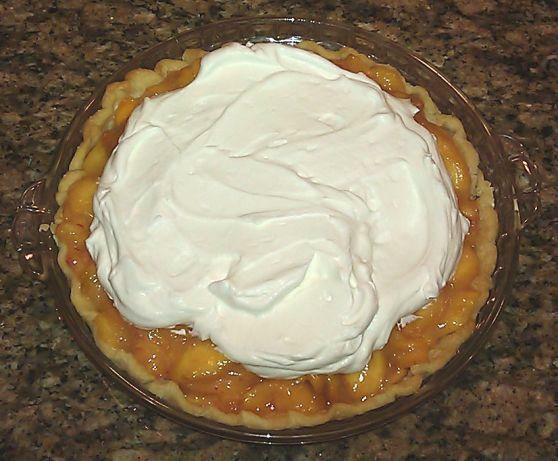 Today I'm going to share with you my grandmother's fresh peach pie recipe. You'll make it and want to hide it from your kids/spouse/roommates and enjoy it all to yourself. It really is that good. Prepare and bake your favorite pie crust. Set aside while you make the pie filling. Let set for 1/2 hour. Drain juice from peaches to make 1 cup. Let peaches set and continue to drain. Heat the juice. Mix 3 T.cornstarch with a little cold water, then add to the heated juice. Cook until thick and clear. Add a little butter. 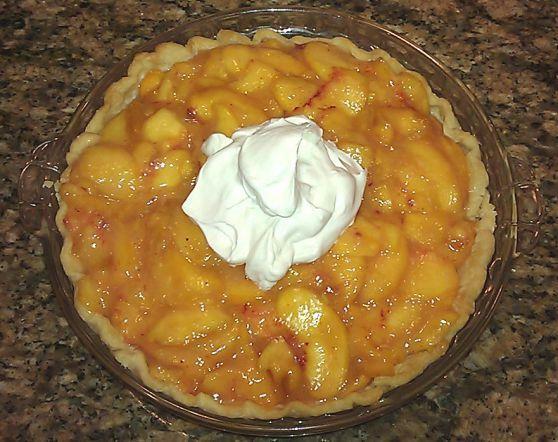 Add peaches to sauce and pour into crust. Chill. Top with whipped cream. * I was planning on taking a picture of an individual slice, but once this pie was cut my stomach took over and I immediately abandoned all documenting aspirations. Enjoy!